This is a simple cake! That’s something I’ve come to appreciate now that I’ve made some more fussy ones. 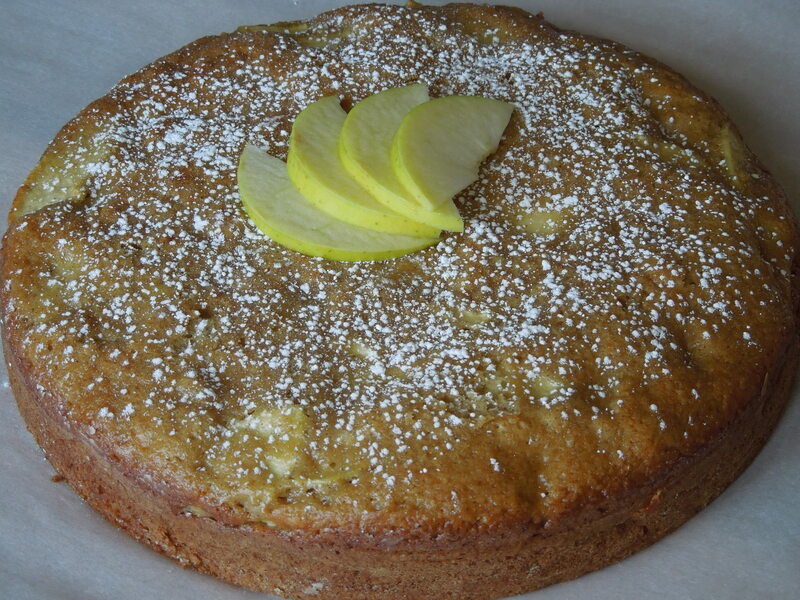 This light apple cake can be quickly made while dinner is in the oven for a weeknight dessert (make it earlier in the day if you want it completely cooled). 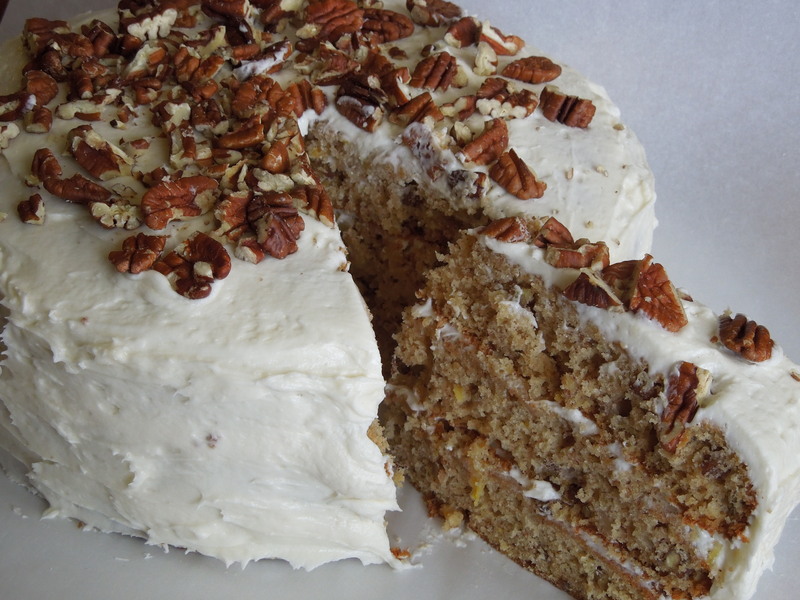 It has all the family favorite flavors like apple, cinnamon and vanilla. According to Family Circle Magazine, each slice has 190 calories. Not bad! Unless you eat several slices. Or the whole thing. I could be inclined to do just that. 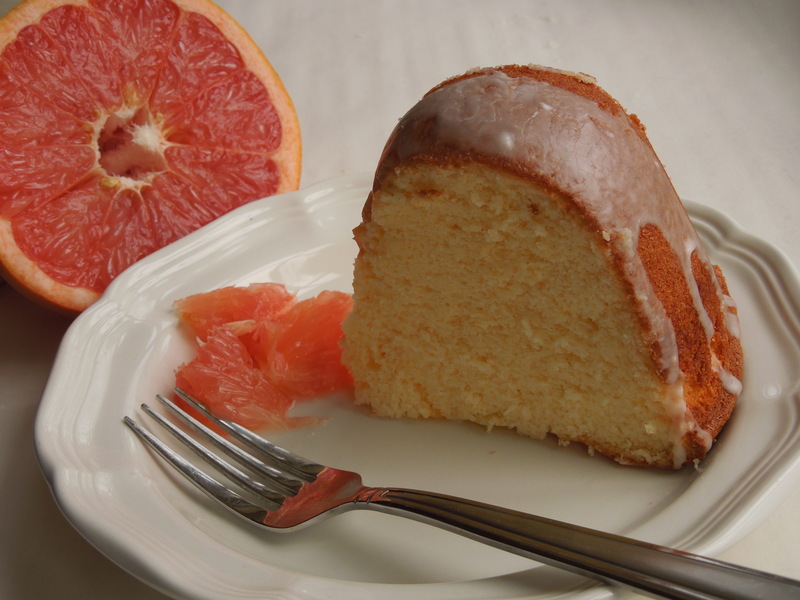 Cake, simple or not, is pretty hard to resist. Heat oven to 350 degrees F. Butter and flour a 9-inch round cake pan and line with parchment paper. In a small bowl, whisk flour, baking powder, baking soda, cinnamon and salt. In a large bowl, whisk eggs, sugar, applesauce, oil and vanilla extract. Stir in sliced apple. Stir flour mixture into apple mixture until blended. Turn into prepared pan; spread evenly. Bake at 350 degrees F. for 25 minutes or until toothpick inserted in center comes out clean. Let cool in pan on wire rack 5 minutes. Invert on rack to cool completely. Dust with confectioners’ sugar. With some Irish roots in my blood (my great-grandmother on my mother’s side was from Ireland), one would think I would have a recipe for Irish soda bread under my belt. I’ve eaten it before but never made it myself. My mother not-so-fondly recalls the bread her grandmother made. She said it was hard as a rock and had an awful taste. Now I don’t know what recipe my great-grandmother used to make her soda bread or the reason my mother hated it so much. Maybe it wasn’t fresh by the time my mom had a slice. 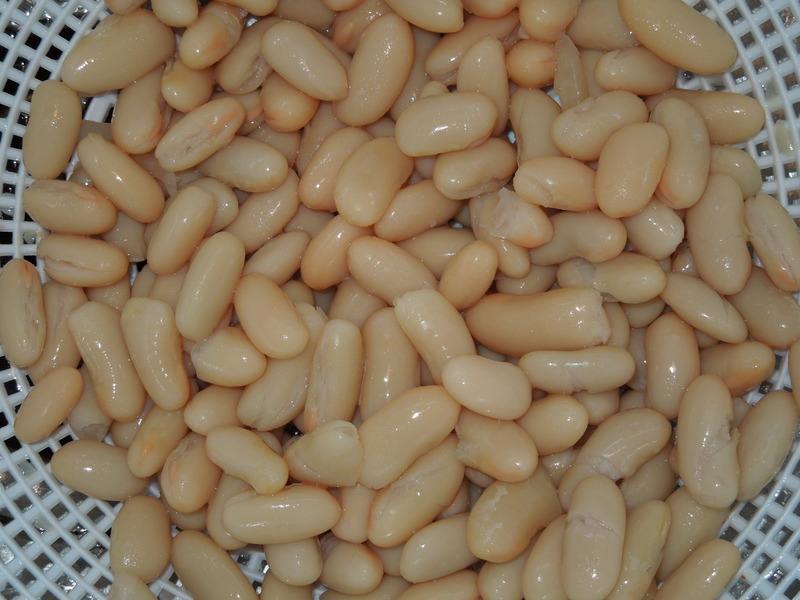 It must be eaten up quickly or wrapped tightly and frozen for another day. Maybe my mom just didn’t care for this simple table bread. Whatever the reason, I’m sure anyone who has carried a disdain for Irish soda bread would change his or her mind after trying the lovely loaf pictured above. You can find the recipe at this week’s TWD: Baking with Julia hosts: Chocolate Moosey and My Culinary Mission. You only spend a few minutes mixing five simple ingredients: flour, baking soda, salt, buttermilk, and raisins. You gently knead the dough with a light hand, pat the dough into a 6 inch disk, slash an X across the top, and bake for about 50 minutes. Done and done. So simple. Slathered with butter or jam it’s delicious! 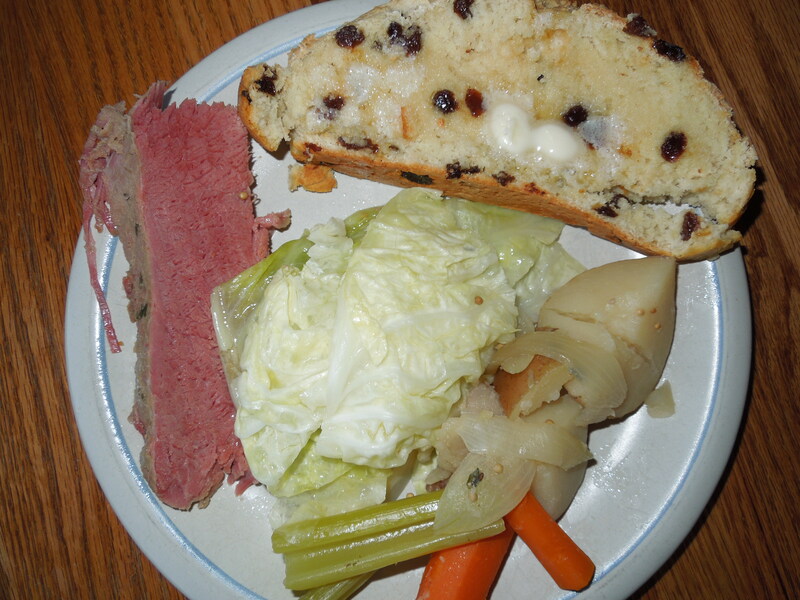 We enjoyed ours on St. Patrick’s Day with our corned beef and cabbage. Now the raisins are completely non-traditional but I couldn’t resist tossing in a handful. I briefly soaked them in hot water so they could regain some of their juiciness. I’ve learned that dried fruit only gets drier when baked so it’s often a good idea to give them a good soak. Next time maybe I’ll try soaking the fruit in some bourbon or rum for extra flavor. 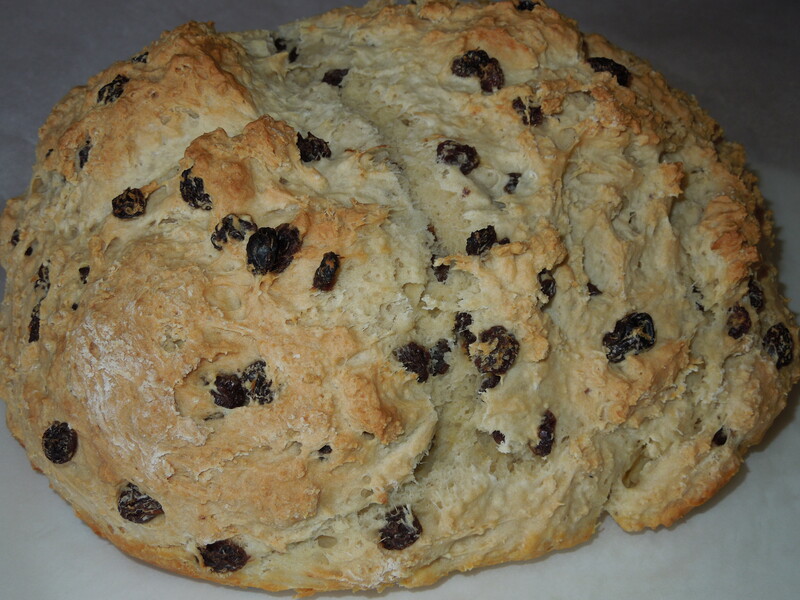 Speaking of tradition, Epicurious has a great interview with an Irish chef detailing the history of Irish soda bread. I’ve learned that Americans have taken some liberties with the classic recipe. It was also interesting to learn that one of the reasons for slashing an X across the top was to “let the devil out of the bread.” It’s certainly a recipe with a rich history. I will probably not wait for St. Patrick’s Day to roll around again before I whip up another loaf. I might switch it up next time too. Some interesting variations include using whole wheat flour for part or all of the bread, adding cheese, orange or lemon zest, or other dried fruit like cranberries. All non-traditional but I’m sure each would turn out great. I’m certain I can even get my mom to like it. Not only did I find myself with overripe bananas on my counter, but also with leftover chocolate from the tartlets I had made a few weeks ago. (The only reason “leftover chocolate” can even exist in my household is because I hide it in the back of my baking cabinet.) 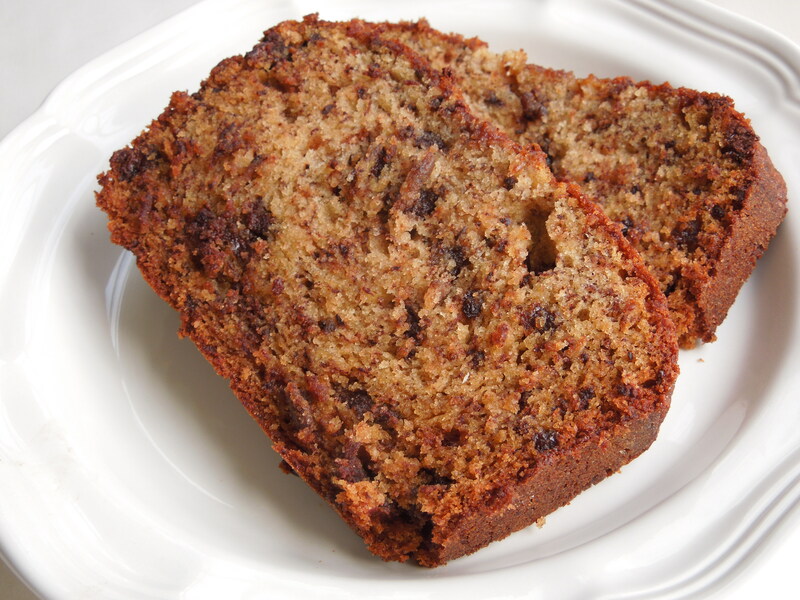 Then I came across this recipe for banana-chocolate bread and knew that I was destined to make it. If banana bread married chocolate chip cookies I imagine it might go something like this. Chopping the chocolate yourself instead of using chips really distributes the chocolate flavor and leaves you with big bites of chocolate goodness. Preheat oven to 350 degrees F. Butter and flour a 5 x 9 inch loaf pan. In a medium bowl, whisk together flour, baking soda, and salt. In a large bowl, using an electric mixer, beat butter and sugar on medium-high until fluffy, 3 minutes. 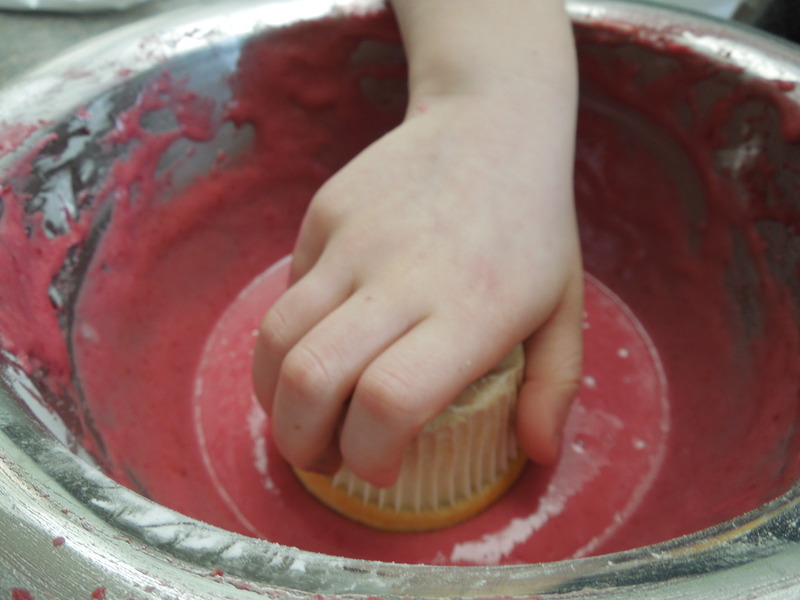 Add eggs, one at a time, beating well after each addition and scraping down the bowl as needed. Beat in bananas, sour cream, and vanilla. Beat in flour mixture and chocolate on medium. Pour batter into pan. Bake until a thin knife inserted in center of loaf comes out clean, 50-60 minutes. (I thought my top was overbrowning slightly here so I covered it with aluminum foil for the last few minutes). Let bead cool in the pan for 10 minutes. Remove bread from pan and let cool completely on a wire rack. 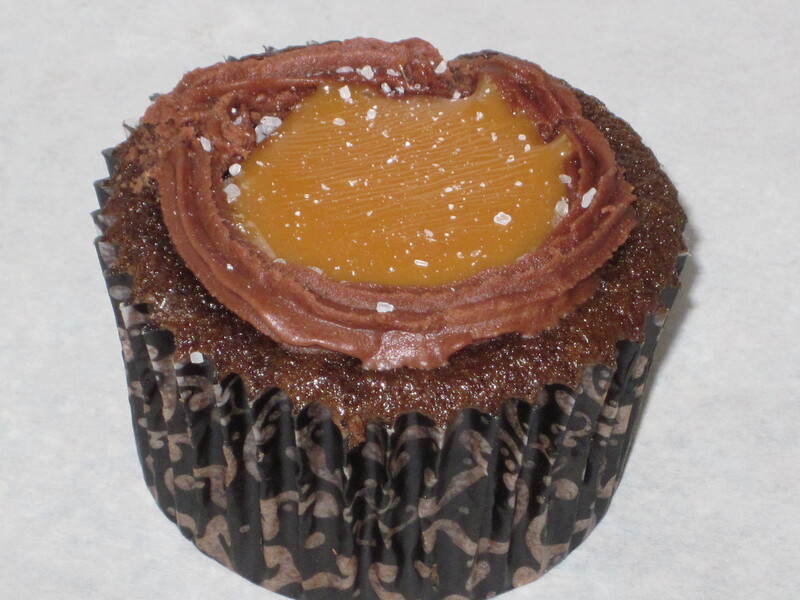 I’m baking and learning about new confections with the TWD baking group. This Tuesday’s recipe is rugelach. I had never eaten it or made it before. I wasn’t even sure how to pronounce it (the dictionary says rŭg’ə-ləKH). What I have learned is that rugelach are traditional Jewish pastry-like cookies. The fun part is they can have endless flavor combinations. 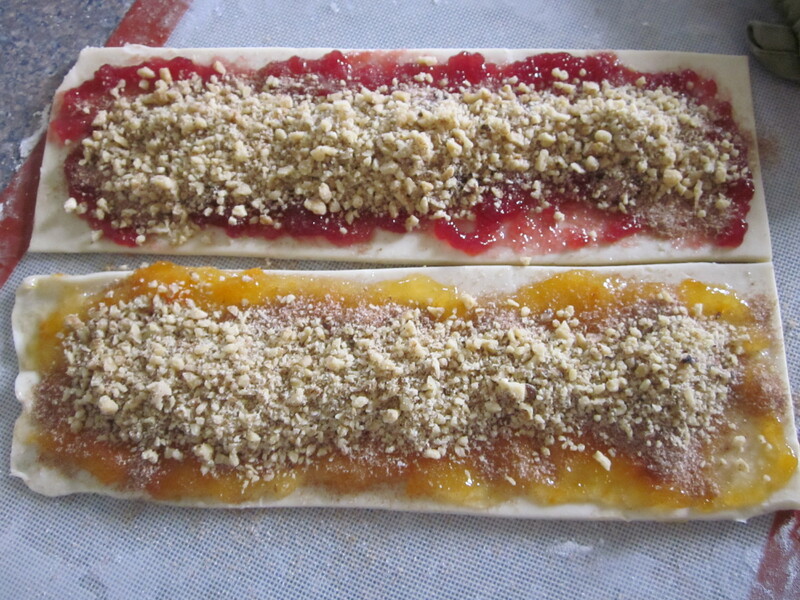 A cream cheese dough is spread with jam, sprinkled with cinnamon sugar, then filled with nuts, dried fruit, or even chocolate. 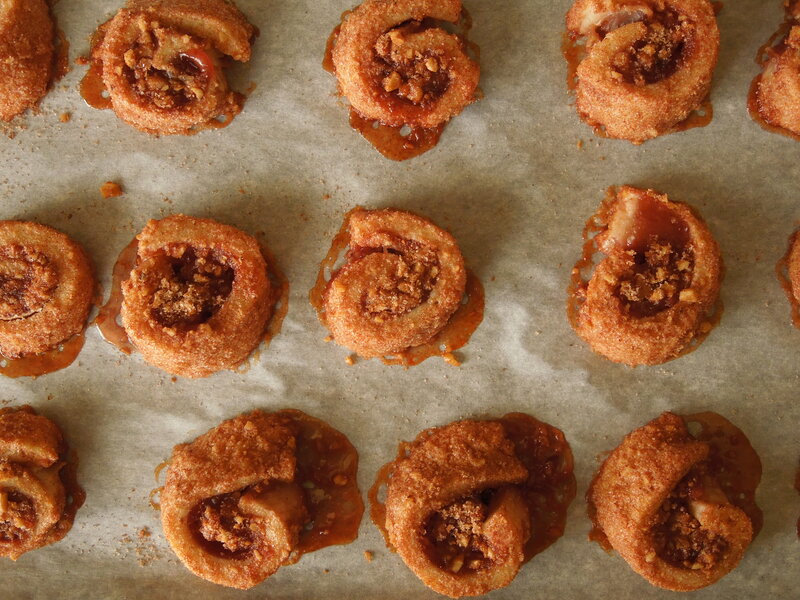 Rugelach cookies can be rolled into a crescent shape or rolled and cut pinwheel style. As with every TWD blog post you can find the recipe at this week’s hosts: The Urban Hiker and My Baking Heart. 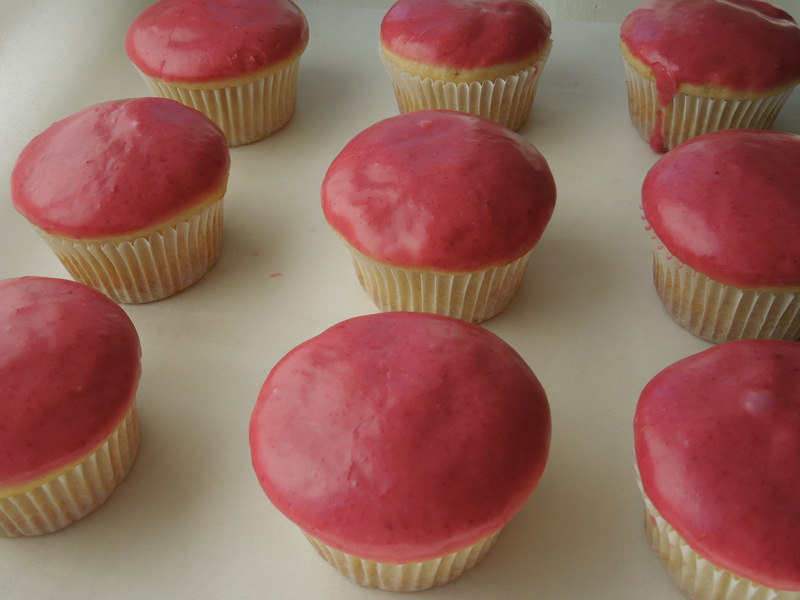 So this baking adventure took me three days. The first day I made the cream cheese dough in my KitchenAid mixer. I had no problems here and wrapped it well and let it sit in the refrigerator for the next day’s work. Rolling and filling the dough was on the second day. 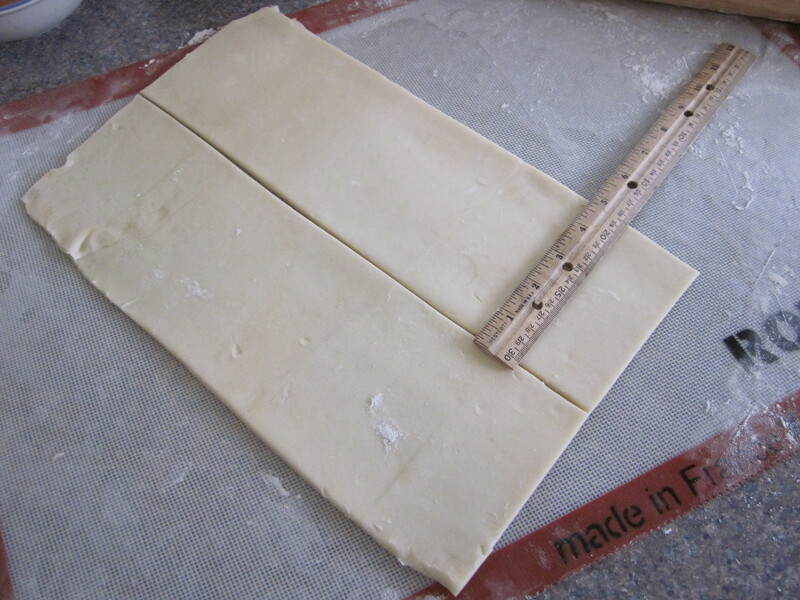 This recipe calls for cut rugelach so each piece of dough was rolled into a rectangle 14 inches by 10 inches and 1/4 inch thick. I am really a novice at rolling out pastry or pie dough so this was a challenge for me. It was a little too thin in a few spots but it worked. 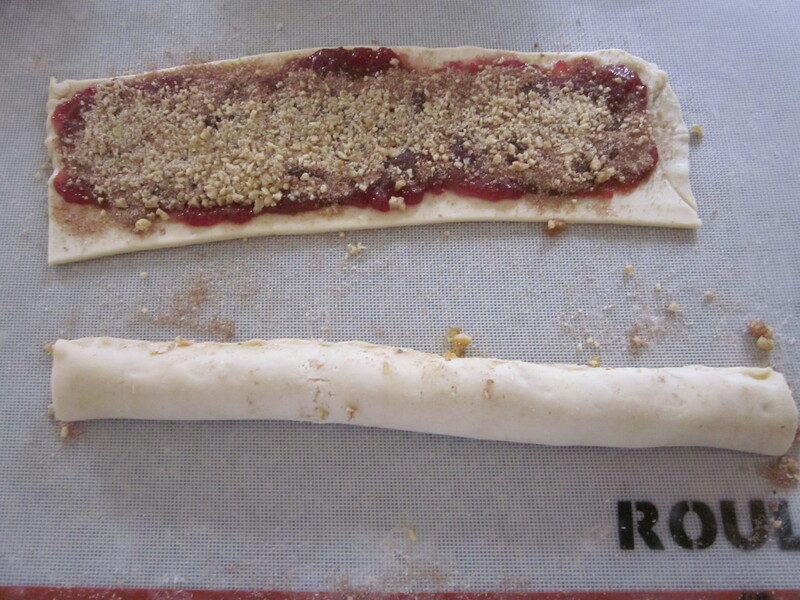 You take the rolled out dough and cut that in half lengthwise. Then you trim the edges. This leaves you with two rectangles. 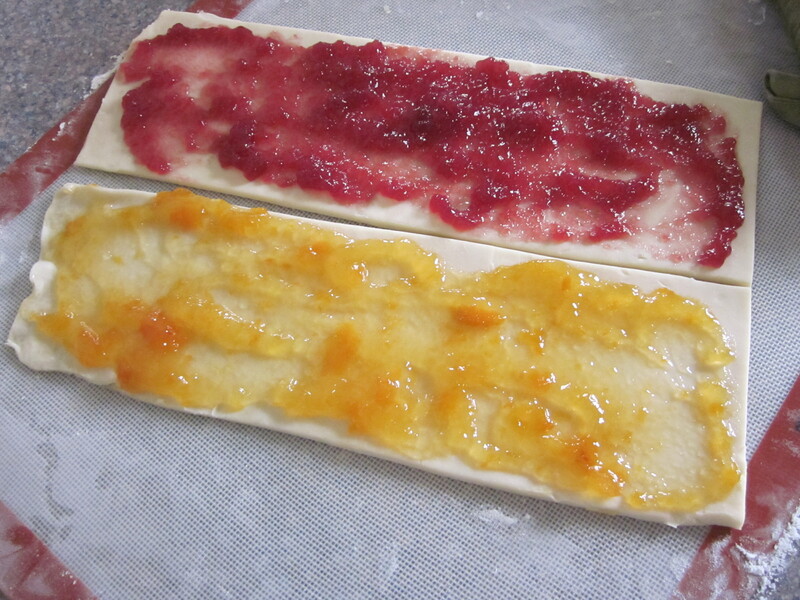 Just like spreading sauce on a pizza, you spread each half with your choice of jam. 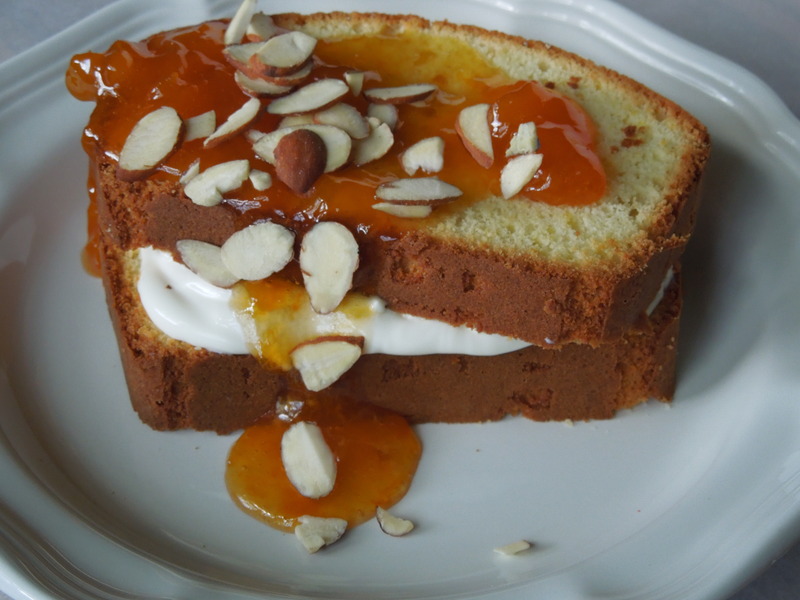 Traditional flavors are apricot and prune. 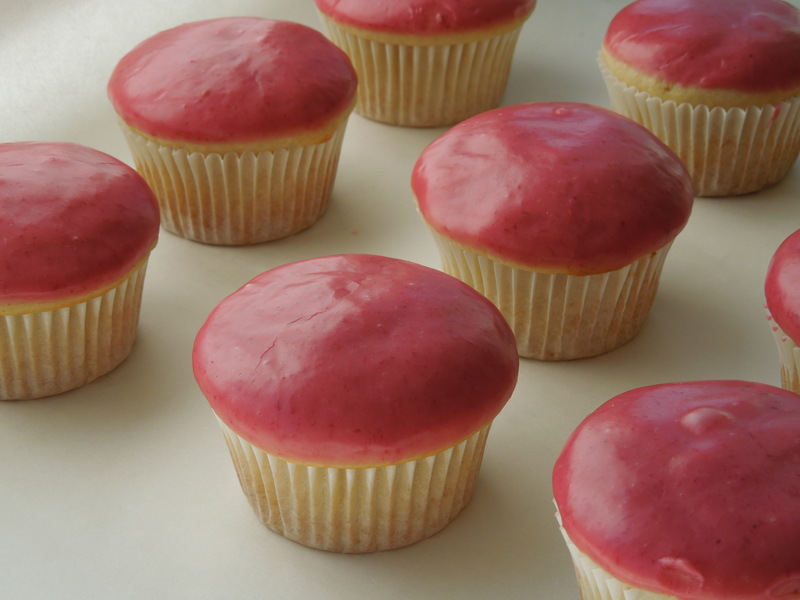 I went with apricot and raspberry. Then you sprinkle it with a brown-sugar cinnamon mixture and nuts. You could also add dried fruit here, but I kept it simple and skipped the fruit. You must press lightly here to keep the filling in place. 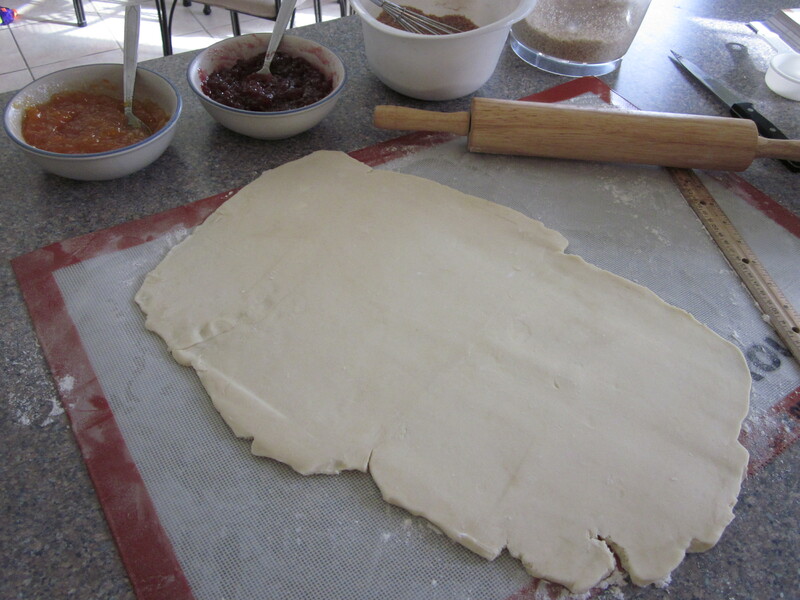 Last, starting with the long end of dough you roll up each rectangle jelly-roll style. This was really tough! Even though I skipped adding additional dried fruit I felt there was too much filling. It was really messy but fun. These rolls get wrapped in plastic wrap and refrigerated overnight. With this recipe I had four rolls total. The third and last day I brushed these rolls with egg wash and sliced them into 1 inch wide pieces. 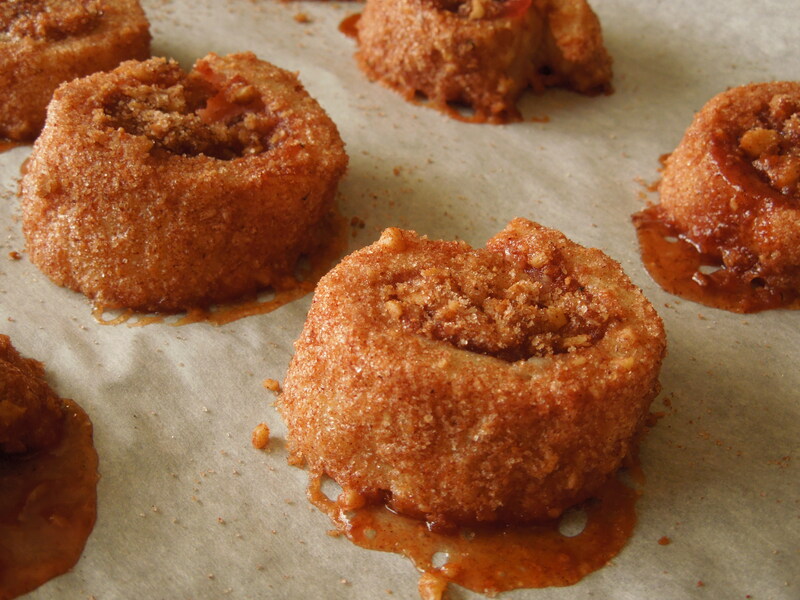 The rugelach were then tossed in even more cinnamon-nut sugar. 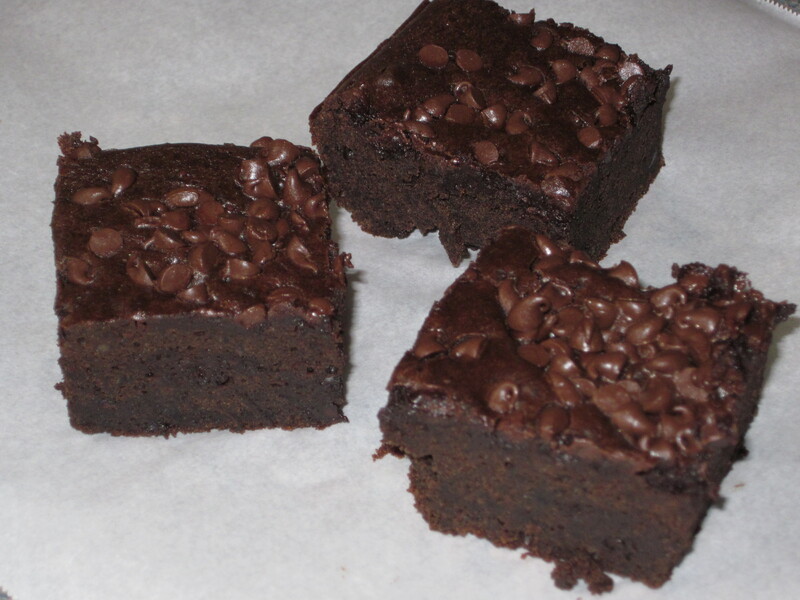 I baked them for about 24 minutes at 375 degrees F. This was a little less time than the recipe called for. The biggest challenge baking these rugelach was not letting the bottoms get too brown. I doubled up my cookie sheets to help keep the bottoms from burning. I really had to watch them closely the last few minutes to prevent them from burning. This recipe was new to me so I tried to stick to it closely. 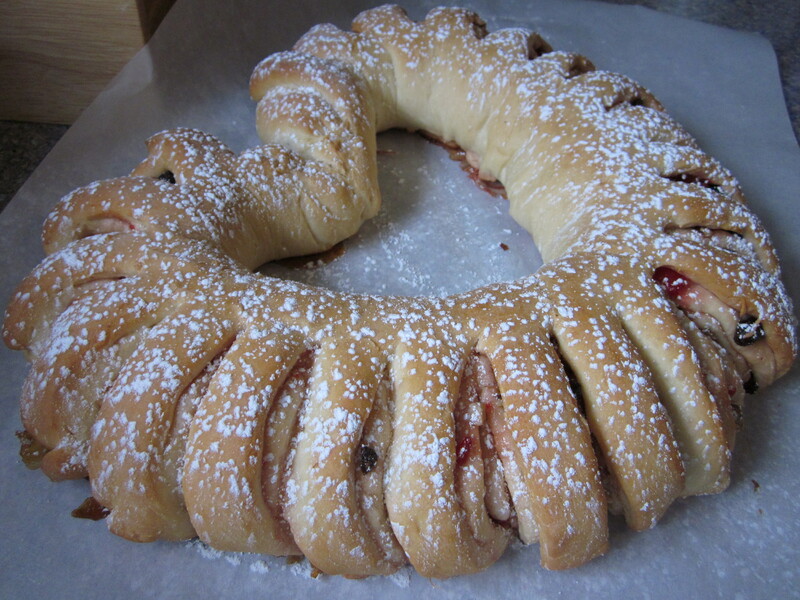 When making them again I would like to try the more traditional crescent shape. It was really hard to keep these rolls together. I also thought this recipe called for too much filling and made a ton of extra cinnamon-nut sugar. I would reduce both of these. Rugelach are delicious! Making these has inspired me to search around the internet for more rugelach recipes and ideas. Here are some interesting flavor combos I am kicking around for next time (found on the community boards on chow). Do you make rugelach? What are your favorite flavor combinations? 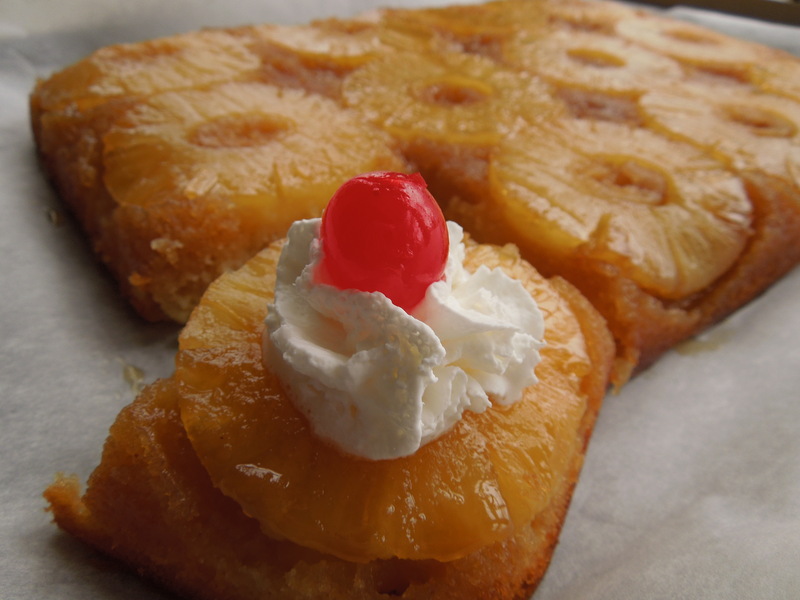 I adore pineapple upside-down cake. It’s just one of those classics that I return to over and over again. I’ve even asked for one several times instead of a birthday cake. 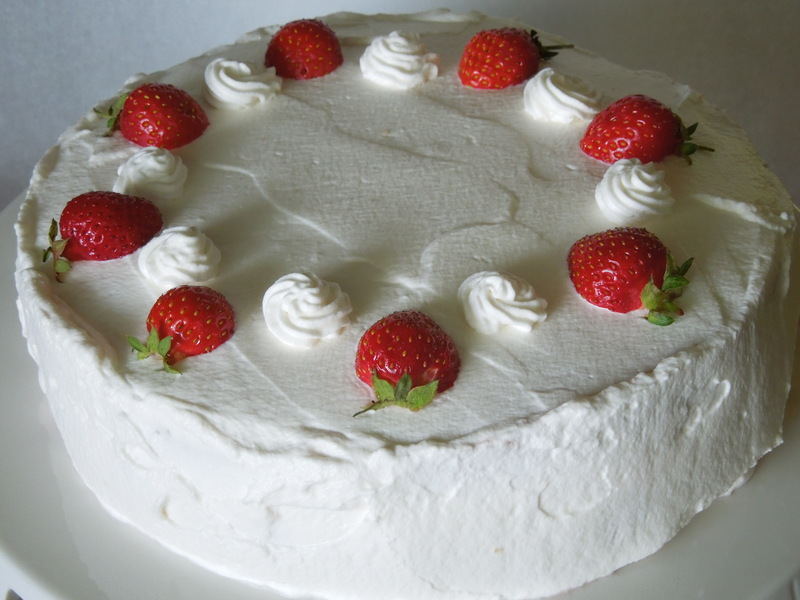 This is a relatively easy recipe that makes a substantial 9 x 13 cake. I used a glass pyrex pan which worked nicely here. The topping stayed put and gave me no trouble at all. My son watched in awe as I flipped the cake over to reveal the pineapple top. (I love that he thinks I am some kind of master baker. He is five years old and I will enjoy it while it lasts.) I like that this is a dense coffee cake. It makes for just the right amount of cake to pineapple topping. Don’t forget the cherry on top to make it extra special! Heat oven to 350 degrees F. Butter the bottom and sides of a 13 x 9 x 2 inch baking pan. Line the bottom of pan with parchment paper; set pan aside. For pineapple topping, melt 1/2 cup butter in a medium saucepan over low heat. Stir in 1 cup brown sugar. Bring to boiling over medium heat, stirring frequently. Pour into prepared pan. Drain pineapple rings, reserving 1/2 cup juice. Fit 12 rings into bottom of pan. In a medium bowl whisk together flour, baking powder, salt and nutmeg. In a large mixing bowl beat softened butter, granulated sugar, and 1/2 cup brown sugar with electric mixer on medium speed for 2 minutes, scraping the sides of the bowl occasionally. Add eggs; beat until combined. On low speed, beat in half the flour mixture. Pour in reserved 1/2 cup pineapple juice and the milk; beat until combined. Beat in remaining flour mixture and vanilla. Spread batter carefully over pineapple slices in pan. Bake for 35-40 minutes or until toothpick inserted near center comes out clean. Cool in pan on wire rack for 10 minutes. 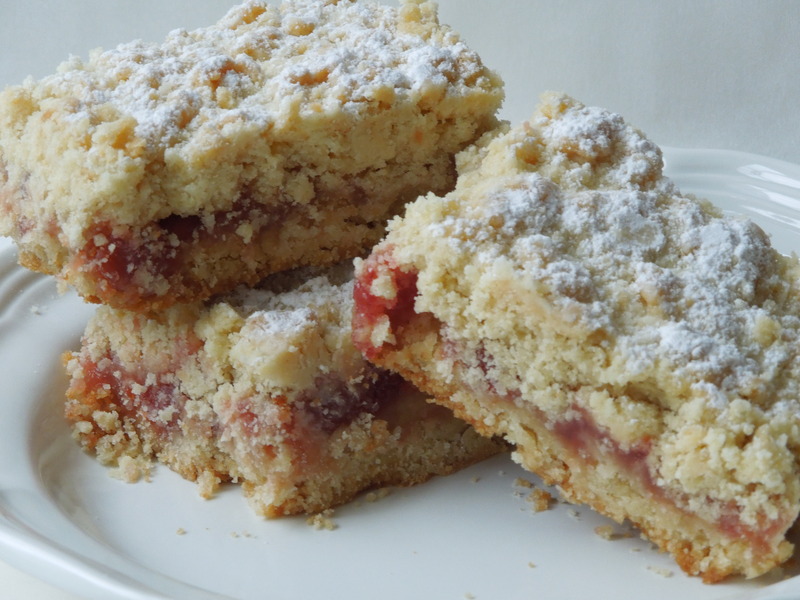 Place a serving tray or baking sheet over coffee cake; carefully invert. Peel off the parchment paper. If any pineapple sticks to the pan, gently replace on cake top. Top with whipped cream and maraschino cherries. Yum!